A small desk can be a thing of beauty, because it fits in nearly any room in the home that has a nook or a cranny, and creates a dedicated place for work or study – whether that means a laptop or a letter opener. Limited storage space forces you to figure out how to organize your desk, which in turn helps to organize your thinking. And we could all use a little more efficiency! A versatile table behind a sofa, like Bassett Furniture’s Crossbuck Desk, makes a perfect home desk. Pull up an accent chair and you can quickly to get to work. The question some people have is where to arrange your desk items attractively (or out of sight) when you have limited desk storage space. The rules for how to organize your home office desk are the same as the rules for how to organize your office desk, with one caveat: keep it pretty! For ideas about desk organization ideas, read on. Consider who will use the desk, and what tasks they will be doing. Paying bills? Writing letters? Working on a laptop? Doing homework projects? Crafting? Based on those tasks, decide what items need to be close at hand, and which items could live just as easily in another room. You may need part of the desk for a laptop, and part for taking notes or paying bills. Consider who else uses the room. An office in a guest room that sees occasional use has different storage requirements than a desk that sits in a sunny corner of the living room. Assemble the furniture you have available, and figure out what else you need to complete the room. Keep some mobile storage. For occasional use, find a desktop tray to keep all your necessities, and store it in a closet or on a shelf when not in use. A rolling storage cart is another option to keep you mobile, and you can even tuck into a closet when it isn’t needed. Use bookcases. Bookcases are perhaps the most elegant way to make some extra space for home office supplies. Bassett Furniture’s Bella Storage Collection can be mixed and matched to tailor the space you need for supplies. Find a desk organizer. A pretty desk organizer keeps pens, pencils, staplers, notepads, and other tools attractively within reach. The key to organizing a desk is to limit the items that accumulate. Limit your paper storage. A combination of storage boxes, magazine boxes, and binders can help you store papers that you need in the short term. Or you may be able to store what you need in a basket underneath the desk. Look to the walls. Use walls for storage to keep a desk from looking cluttered. Ideas like wall mounted baskets, pegboards, corkboards, or shelves mounted above a desk can maximize vertical space. Cover bulletin boards with fabric to create attractive artwork that doubles as a spot for holding reminders, notes, and more. Use drawer organizers. If you have a drawer, customize it with movable organizers in different sizes. Combine storage and seating. A storage ottoman can be used to stash books, boxes of papers and supplies, or even a laptop. Pull it up to the desk when it’s time to pay the bills or help with homework. There is a payoff for all the thought you put into how to organize your desk! Research shows that a little organization boosts productivity by saving time, removing distraction, and helping with clarity. And beyond that, who doesn’t love to look at a tidy desk? Create a cozy nook for work, and just see what happens. When it comes to making a room serve more than one purpose, the key is to minimize visual clutter. 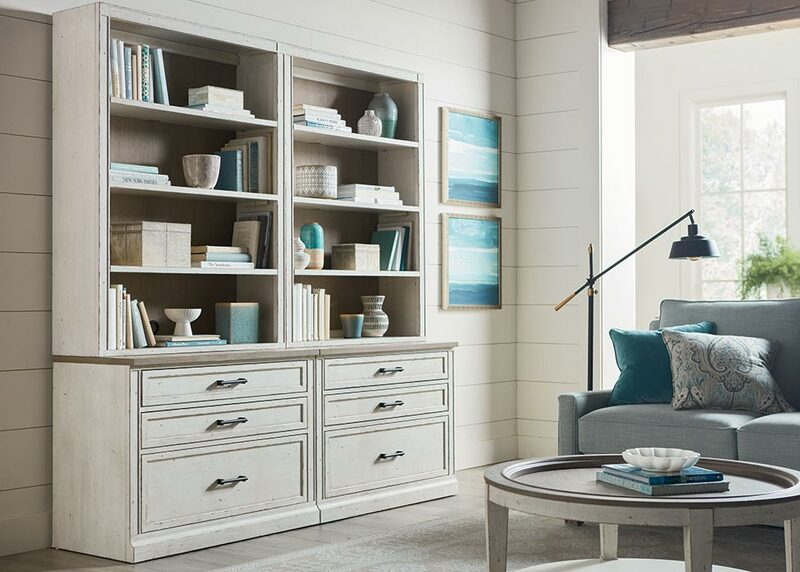 Stop in to a Bassett Furniture store to see what beautiful storage options are available.